Daniel Cavallin and Andrés Cavallin, aka the “Cavallin Brothers,” are game designers. They created their first video games back in the 1980s and won a programming contest at the ages of 11 and 12 respectively — before the IBM PC was even invented! They founded TrueApps LLP, with the mission of creating entertainment software to blend real life and fantasy. First up, True Vampires. It literally consists of another world, a version of this one but where players have become the undead. Players will access this via their Smartphones, using a new App. Not a game in usual sense –because there is no goal or winning conditions — True Vampires might well seem like the first version of Star Trek‘s Holodeck. Players use filters and other tools to not only become nosferatu, but record events in this world through a filter of the game-world. Unlike (for example) Second Life, this app does not require a desktop or even laptop. Either Android of iPhones can support it, with an interactive experience far more mobile and linked to those actually around you. 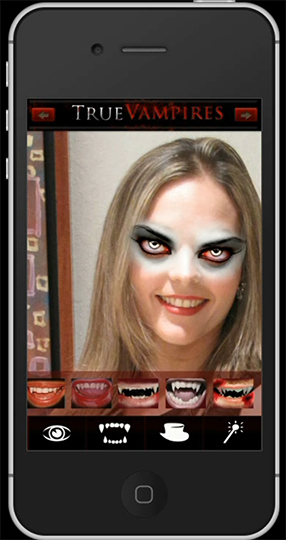 Portrait Editing: Use sticker like eyes, mouth, accessories and apply “dark and elegant” photo filters. An edited Portrait can also be used on the personalized videos (below). Thus a player can look like anything from Spike to Orlock to Vampirella or Bill on True Blood. Video Diary: Using a couple of photos from your camera roll or Facebook players will be able to create videos that mix pre-rendered scenes with those photos. These videos are presented as “Powers” and used to In-Bite (see below) friends into a specific vampire family, telling the story of how they were converted. In effect, this resembles (somewhat) the idea of Clans in White Wolf’s Vampire role playing games that also saw life (or undeath) in the t.v. series Kindred The Embraced. Except this reality stems from your own choices and imagination rather than the r.p.g.‘s designers. Alternate Reality: First, the player captures a short video on a smartphone. Then, using pre-rendered effects, the app blends a new video mixing reality and fantasy. Each pre-rendered effect is associated with a “Power,” part of the supernatural nature of this alternate reality. In-Bite system: Entering into the game (or reality) involves simply accepting an invitation. No limits exist as to how many a player can turn down (after all, one might wish to be bitten by someone specific for all sorts of reasons). However, once accepted an invitation makes a player part of that vampire family forever. Players may also also start their own family. Empathy and Telepathy: Send messages and locate family member on the map (if they allow it of course) via smartphones or a GPS. Thus modern communications tech becomes a way to wield such “powers” in real time. Kickstarter Founders will have the “Town Sheriff” power that will extend these power to members of all families. Yes, this has a Kickstarter campaign to fund all the final efforts needed (including a video from the Cavallin Brothers about how this will all work and look). This project will only be funded if at least $80,000 is pledged by Thursday Aug 22, 11:38pm EDT. If this gets funded, we’ll have to do a Vampires.com clan / family.